Windows-10, the example is also for Windows 8.1 and Windows 7 suitable! This solution example is handy for anyone who often changes the sound volume options on Windows 10, as well as learn how to create a shortcut to this important Windows feature. Especially with Microsoft Windows Tablets, pinning to Windows Start is a handy thing when working in tablet mode (eg on Ms Surface). Is also suitable for Windows 8.1 / 7. 1.) ... Volume mixer desktop shortcut on Windows 10! 2.) ... Define keyboard shortcuts for the volume mixer under Windows! 3.) ... Pin the volume mixer to the taskbar, or Windows 10 Start (Pinnen)! 4.) ... What can I do if the volume mixer is not working properly? See also: ► . Customize Auto-Play settings in Windows 10, (enable disable)! 1.) Volume mixer desktop shortcut on Windows 10! You can easily start the Volume Mixer via Sound Symbol in Window 10 Control Panel. Or Via Windows+R and the command sndvol (... see Image-2). 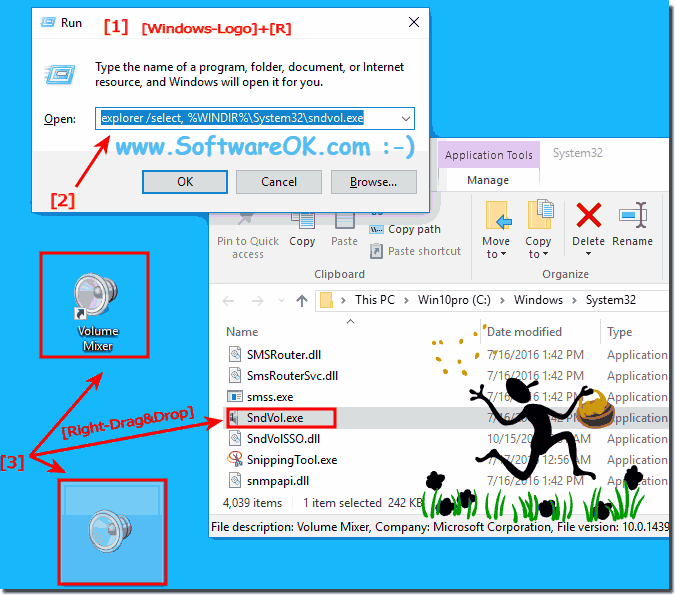 This command will auto select the sndvol.exe in C:\Windows\System32\ folder. Useful info: . Windows 8 / 10 on screen keypad at startup / log in without keyboard! (Image-1) Volume Mixer Desktop Shortcut for Windows! Many sound cards or sound processors come with software that you can use to configure and test sound card settings. Check the information that came with your sound card or computer. Most speakers have a volume control, but you can also control the overall level of sound on your PC. Laptops don't usually have sound cards. Instead, they have integrated sound processors. However, many of the questions and answers in this topic apply to laptops. (Image-1) Open Sound Volume Mixer in Window 10! Move the sliders up or down to raise or lower the volume of your speakers, Windows sounds, or other sound devices or programs listed in the Volume Mixer. 2.) Define keyboard shortcuts for the volume mixer under Windows! A keyboard shortcut is very handy on desktop PC to start the volume mixer even faster. You can also start it from the Run dialog, but a direct keyboard shortcut is preferred by many Windows users because it's handy. If you have created the desktop shortcut for the volume mixer, you can assign a keyboard shortcut for the Windows volume mixer! Simply right-click on the speaker icon, then goto to the Properties option and define the shortcut key. 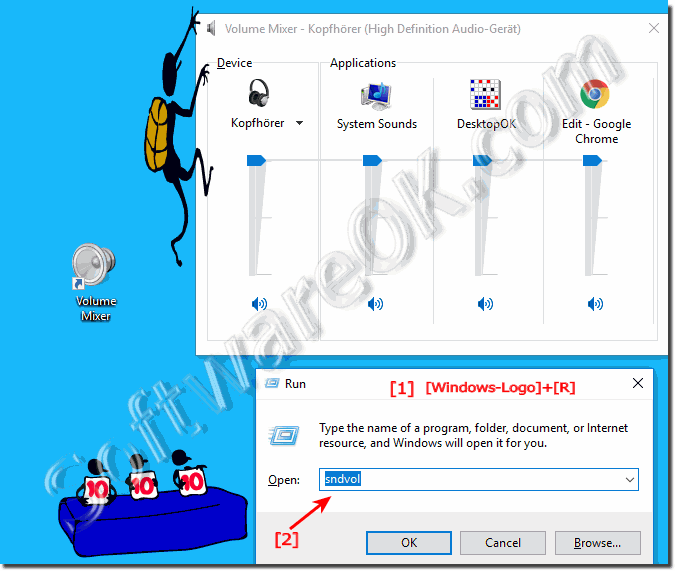 (Image-3) Windows-10 Volume Mixer Desktop Shortcut-Key! 3.) Pin the volume mixer to the taskbar, or Windows 10 Start (Pinnen)! If you would like to start the volume adjustment via the Start menu in Windows 10, or from the desktop taskbar, you do not have to read any Windows reference books. With the volume desktop shortcut you also have the option to make the volume mixer even faster and more accessible. Just right-click on the desktop shortcut and pin it to Start and / or optional on the windows taskbar. (Image-4) Windows-10 Volume Mixer Pin to Start or Taskbar! 4.) What can I do if the volume mixer is not working properly? Sometimes it is important and you should definitely install the manufacturer's original driver. For example, the Realtek driver is often the case that Windows 10 installs its own driver. There is no error message, but there is no sound, the volume mixer does not work properly. After installation of the original driver, everything works! This error on Windows 10 often occurs in laptops, tablets and laptops! See also: ► Customize Auto-Play settings in Windows 10, (enable disable)! Windows-10 - FAQ-174: Windows-10 Volume Mixer Desktop Shortcut, how to create? Window 10 home addition and Volume mixer? Possible to Volume mixer into windows 10 home? Wher eis Volume mixer in windows home? Volume mixer windos 10 home? How to use Volume mixer on windows 10 home? Microsoft windows 10 home volume mixer shortcut access? How to install Volume mixer in win 10 home basic? Is Volume mixer supported in win 10 home? How to enable Volume mixer on windows 10? Allow Volume mixer in to windows 10 home? How to enable Volume mixer at windows 10? How to use Volume mixer at windows 10 home? Windows 10 home Volume mixer location? I don't have Volume mixer in windows 10 home? Volume mixer windows 10 Enable rdp Volume mixer Windows 10 home? Windows Volume mixer work in windows 10 home? Get Volume mixer sessions for windows 10 home? Volume mixer w10 home and Enable/Volume mixer windows/10 family? Add Volume mixer windows 10 home? How to access volume mixer shortcut access in windows 10 home? Setup Volume mixer for windows 10 home? Microsoft Volume mixer on windows 10 n home? How to enable Volume mixer on home windows 10? Activate Volume mixer w10 home? Activate Volume mixer on windows 10 home? Windows 10 home Volume mixer? Can you open Volume mixer with windows 10 home? How to volume mixer shortcut access windows 10 home? Volume mixer shortcut access windows 10 home n from android? Use Volume mixer server windows 10 home? How to enable Volume mixer in windows 10? Windows 10 home rrmote desktop? Volume mixer on windows10 home? Find Volume mixer Windows 10? Volume mixer connection programs for windows 10? Location of Volume mixer connection in windows 10? How to open Volume mixer in windows 10? How to start Volume mixer windows 10? Volume mixer location on windows 10? Windows 10 Volume mixer location? Microsoft c server in volume mixer? Volume mixer exe file location in windows 10? How to create a volume shortcut windows 10? Windows 10 desktop audio volume? How to make a volume control shortcut? Volume mixer Windows 10 exe? Find and open the Windows-10 Volume Mixer Desktop? WINDOWS 10 CREATE A LINK TO VOLUME MIXER? Windows 10 Volume mixer not installed? Windows 10 home Volume mixer service? I cannot Volume mixer from win 10 home to win 8? Windows 10 home Volume mixer access? How to setup Volume mixer windows 10 home? Volume mixer on windows home? Enabled Volume mixer on windows 10 home? How to allow Volume mixer windows 10 home? Windows 10 home volume mixer shortcut accesss? Windows 10 home to enable Volume mixer? Install Volume mixer server on windows 10 home edition? Windows 10 home Volume mixer enabled but not working? Enable Volume mixer on windows 10? Volume mixer for windows home? How to enable Volume mixer in windows 10 home single language?